If it’s your first visit to the French Riviera then a good place to stay would be Nice. 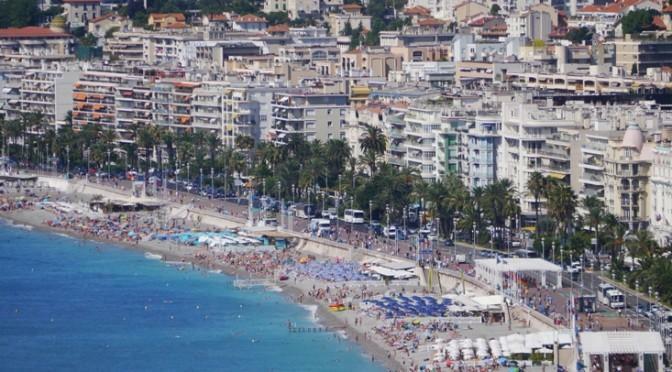 The reason for this is that Nice has excellent public transport systems and is on the main coastal rail line which runs from St Raphael to Monaco. From Nice you can also catch the bus 100 which takes you along the lower corniche road. At the last check, the cost was a mere 1.50 euros! From the lower corniche road you will get magnificent views across the bay at Villefranche and of course the approach to Monaco and Monte Carlo. Including trips within Nice itself, there are many day trips from Nice to all the major French Riviera resorts including Cannes, Monaco, Villefranche and St Paul de Vence. If you want to visit St Tropez on a day trip from Nice then there is a boat which takes you to and from St Tropez. Details of the service is detailed at Ferry Boat To St Tropez and the trip gives you about 5 hours in St Tropez. Probably not enough time to visit the famous beaches of The Pampolonne which are about four miles out of town but enough time to have a look round the town of St Tropez and have lunch there. Why not take a trip to perhaps the most famous Riviera resort of Monaco. Monaco and Monte Carlo are the destination of dreams. Arriving there and seeing the millionairs paradise built into the rocks is a sight to take your breath away. The fairy tale principality built around its royal palace perched on the clifftop is out of this world. Magnificent yachts decorate the harbour and in the centre is the Grand Casino. Looking at a map of Provence you will observe that Provence has three main regions, the heartland and the region around Avignon, Aix and Marseille, the area streching up to the high Alps and of course The French Riviera.